Wood; copper-gilt frames, silver pearls and columns, gilt-brass capitals and bases, vernis brun domes, semi-precious stones, intaglio gems, beads, champlevé and cloisonné enamels. Bequest of J.P. Morgan (1867-1943). Possibly made for Abbot Wibald, who headed the Benedictine Abbey of Stavelot (in present-day Belgium) from 1130 to 1158. The triptych was in the possession of the abbey's last prince-abbot when he fled during the French Revolution in 1792; purchased by J. Pierpont Morgan in 1910; bequeathed to the Library by J.P. Morgan (1867-1943). 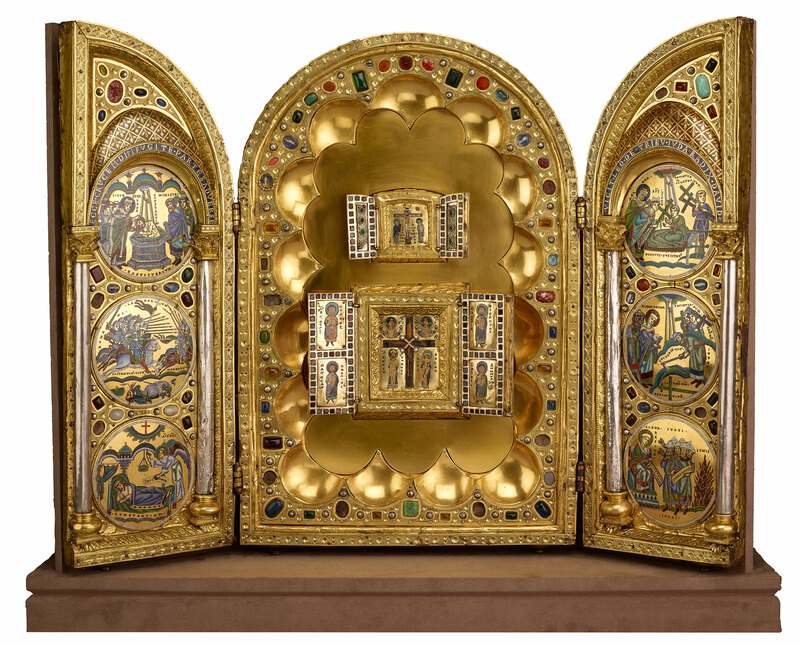 Reliquary of the True Cross, comprising three triptychs. The two small ones in the center are Byzantine and date from the late 11th or early 12th century. The larger triptych which houses the Byzantine works is Mosan and dated 1156-1158. Central panel - contains two Byzantine triptychs. The upper triptych depicts the Annunciation and the Crucifixion. The lower triptych depicts the four Evangelists, four Byzantine military saints, and Constantine and Helena flanking the relics of the True Cross. Wings - contain six enamel medallions (three in each wing) telling the legend of the True Cross. The upper Byzantine triptych depicts the Annunciation (outer wings) and Mary and John beside the Crucifixion (center panel). The lower Byzantine triptych depicts the four Evangelists (outer wings), four Byzantine military saints (inner wings): George and Procopius on the left, Theodore and Demetrius on the right. In the center, beneath busts of the Archangels Gabriel and Michael, and flanking the True Cross composed of the relic itself, are Emperor Constantine and his mother, Empress Helena. The wings contain six enamel medallions (three in each wing) telling the legend of the True Cross.